A splenic infarct is caused by occlusion of the splenic artery or one of its branches, resulting in tissue necrosis. They are be caused by a variety of potential pathologies, however fortunately splenic infarctions are rare events. As the spleen is supplied by the splenic artery (from the coeliac axis) and the short gastric arteries (from left gastroepiploic artery), infarction is often not complete due to collateral circulation. Incidence rates vary significantly, however in predisposing conditions, such as chronic myelogenous leukaemia (CML), rates as high as 72% have been reported, although many of these are asymptomatic. The most common causes of splenic infarction are haematological disease or thromboembolism. Other rarer causes include vasculitis, trauma (including blunt trauma or torsion of a ‘wandering’ splenic artery), collagen tissue diseases, or surgery (pancreatectomy or liver transplantation). Classically, symptomatic patients will present with left upper quadrant abdominal pain, radiating to the left shoulder (known as Kehr’s sign). Less common symptoms include fever, nausea & vomiting, or pleuritic chest pain. However in a significant number of patients, splenic infarcts can be completely asymptomatic, diagnosed purely by imaging or explorative surgery. On examination, LUQ tenderness is common. Other signs may be present depending on any complications that may have developed, as discussed below. As with many cases of acute abdomen, there is a wide range of differentials to consider, narrowed down through clinical features and investigations. However, important common differentials to consider for LUQ pain include peptic ulcer disease, pyelonephritis or ureteric colic, and a left sided basal pneumonia. The gold standard investigation for suspected splenic infarction is a CT abdominal scan with IV contrast. Routine bloods, including FBC, U&Es, LFTs, and coagulation screen, will aid diagnosis, especially if a haematological or thromboembolic cause is suspected. WCC have been shown to be high in around half of cases and raised d-dimer levels may also aid the diagnosis. As the IV contrast cannot reach the infarcted area, a segmental wedge of hypoattenuated tissue becomes visible on CT scanning (Fig. 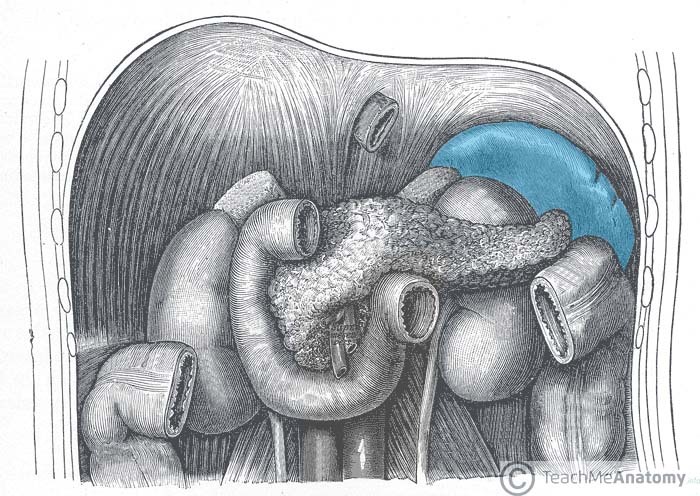 2), the apex of the wedge pointing to the hilum of the spleen from the segmental branching of the splenic artery. If the splenic artery, rather than one of its segmental branches, is affected then the entire spleen will be hypoattenuated. Following treatment, most cases are followed up with repeat CT scanning, which will show either full resolution, fibrosis of the original infarct, or liquefaction of the affected region. There are no specific treatments for splenic infarct. Patients are monitored regularly, ensuring haemodynamic stability, with appropriate analgesia and IV hydration prescribed. Most cases warrant suitable management of the underlying condition in order to minimise future risk. It is important to identify the cause of the infarction, which may require the involvement of a haematologist and an ECHO scan, as well as consideration of long term anticoagulation. Splenectomy should be avoided due to risks of overwhelming post-splenectomy infection (OPSI) syndrome, however this may become unavoidable if complications develop or symptoms persist. Most cases should be delayed to until patient age >2yrs (ideally >10yrs), to ensure appropriate immune response can be developed post-splenectomy. Due to the spleens role in the protection against encapsulated bacteria, vaccination against Pneumococcus, N. Mengitidis, and H. Influenza is advised in extensive splenic infarctions, as well as long term low dose antibiotic cover (ideally Penicillin V) due to the inability to clear encapsulated bacteria without a spleen. The prognosis of splenic infarctions varies enormously, depending on the cause and severity of the disease. Patients with benign underlying disease and asymptomatic infarcts will have an extremely good prognosis, whilst patients with splenic infarct secondary to haematological malignancy will have a far more guarded outcome. The most common complications of splenic infarction are splenic rupture, splenic abscess, and pseudocyst formation. Most of these cases will warrant splenectomy. The embolus seeds infection into the necrotic splenic tissue, yet clinically this can be difficult to differentiate from an uncomplicated infarction. Diagnosis may be based on CT scanning viewed by an experienced radiographer, especially when combined with raised inflammatory markers, however most cases will only be confirmed with explorative surgery. 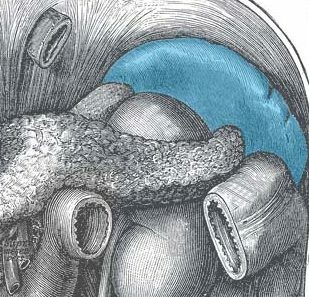 Auto-splenectomy is a rare condition that results in asplenism. Repeated splenic infarctions result in the progressive fibrosis and atrophy of the spleen; when this continues over a prolonged period of time, especially during childhood, this can lead to complete atrophy of the spleen, termed auto-splenectomy. The most common cause of auto-splenectomy is sickle-cell anaemia. Repeated sickle-cell crises lead to recurrent occlusion of the splenic artery. As this can continue throughout childhood, it can cause complete asplenism by adulthood. What condition is not commonly associated with the pathophysiology of splenic infarction? Gold standard investigation for suspected splenic infarction is? What bacteria is the least commonly suspected pathogen post-splenectomy?